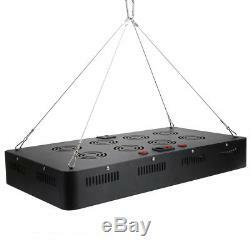 Grow 5001500W COB LED Grow Light Full Spectrum Growing Lamp for Indoor Greenhouse. Our full spectrum LED grow light is extremely powerful and capable of matching the usable output of a HID grow light system per watt. Made by COB High Power Full Spectrum for superior plant growth in all stages. The specific lights emitting from the LEDs are vital when absorbed by the plants' chlorophyll molecules and helps provide a rigorous growth for plants during vegetation. It helps provide deep intensity and penetration through plant foliage for growers who want to maximize their yield while using minimal space. Many retailers provide the same wattage and light spectrum for their LED grow lights. 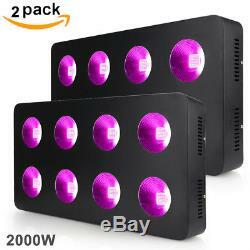 It more than doubles then intensity and penetration compared to most LED grow light kits on the market. 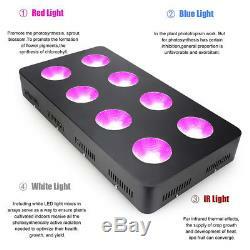 Our LED grow lights are one of the most efficient, high quality, and green option for indoor gardening enthusiast helping you produce the high quality harvest that you desire. 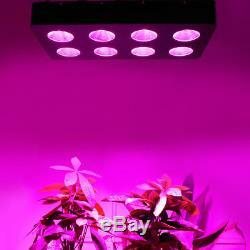 Brand new LED indoor plants grow light. Used high power COB LED Chip , increase intensity of Lm/watt. Full spectrum lighting for the veg and flowering entire grow cycle. Build-in Cooling Fans, low heat light runs. 90 degree reflector, ideal covering on plants. Protector with each LED chips, one burn out, no effect light working. Great for indoor growing in any medium, hydroponics, aeroponics or soil. Free hanging kits for easy set up. 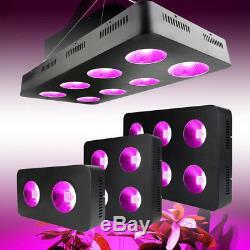 Item Type: LED Grow Light. Watt : 500W 1000W 1500W 2000W. LED quantity: 500W70X2 PCS 1000W70X4 PCS 1500W70X6 PCS 2000W70X8 PCS. 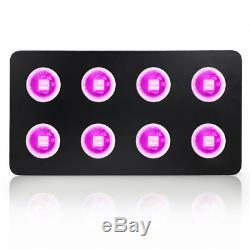 500W 94pcs red light/ 30pcs blue light/4pcs IR / 6pcs white light/ 6pcs warm light. 1000W 188pcs red light/ 60pcs blue light/8pcs IR / 12pcs white light/ 12pcs warm light. 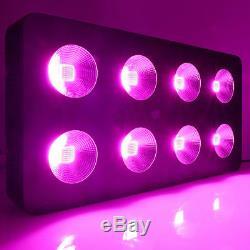 1500W : 282pcs red light/ 90pcs blue light/12pcs IR / 18pcs white light/ 18pcs warm light. 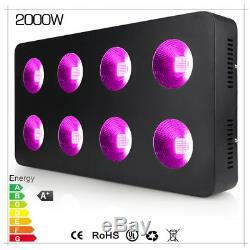 2000W : 376pcs red light/ 120pcs blue light/16pcs IR / 24pcs white light/ 24pcs warm light. > Plugs: US, UK, EU, AU standard plug. > Voltage: AC85 - 265V. > Frequency: 50 - 60Hz. > Operating Temperature: - 5F 120F. > Beam Angle: 180 degree. > More efficient: 100% of the power input for our LED grow lights is used for your plant chlorophyll production. > Better for environment: It saves 50% to 90% in energy consumption compared to incandescent bulbs or fluorescent tubes. > Less Heat: Low heated LED bulbs will protect your plants well. > Less trouble: No ballast to burn out likes other plant lights. > No maintenance costs and 50,000 hours lifetime. > Easy to install and use, plugging into the electric outlet directly. The light is suitable for all stages of plants' growth, it can used for flowers, succulent, hydroponic and greenhouse plants like bananas, flowers, dendrobium orchids, seaweed, green peppers, eggplant, bitter gourd, tomatoes, grapes, lettuce and so on. 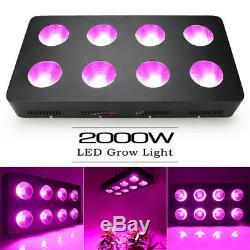 1/2X 500W/1000W/1500W/2000W LED Grow Light. 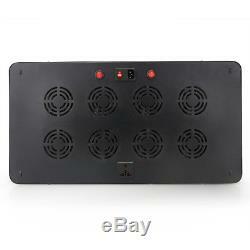 1/2X Free LED Grow Light Hanger. Please list your special requests color, packages, etc. OR, you may choose to have a replacement. We maintain high standards of excellence. Feedback is very important to us. Feedback, so that we can satisfactorily address your concerns. It is impossible to address issues if we do not know about them! Specifications: Description: Integrated reflector plant light Number of beads: Each integrated bead contains Lamp beads Model: Integrated lamp beads Beam angle: 180 degrees Irradiation area: 4-12 square Material: stainless steel Input voltage: AC 85V-275V Operating temperature: 77 -113 Working humidity: 45% -90% Working frequency: 50Hz-60Hz Life expectancy: 50000. 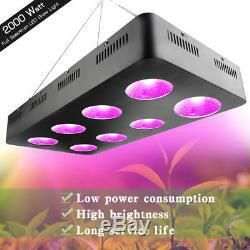 The item "Full Spectrum 500/1500/2000W COB LED Grow Light Lamp Hydro Plant Herb Veg Flower" is in sale since Thursday, May 3, 2018. This item is in the category "Home & Garden\Yard, Garden & Outdoor Living\Gardening Supplies\Hydroponics & Seed Starting\Grow Light Kits". 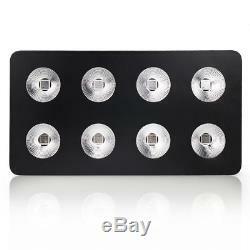 The seller is "ledlight-factory" and is located in ShenZhen. This item can be shipped to North, South, or Latin America, all countries in Europe, all countries in continental Asia, Australia.